Sunday morning, I planned to spend the day packing up the bungalow. The house is done (except for a final coat of poly on the floors) and I need to get all the staging furniture out of there. But it didn't work out that way. I arrived at the house and was surprised to see a small puddle on the kitchen floor. Hmmm.....how did that happen? I pulled out the fridge, but that didn't seem to be the problem. 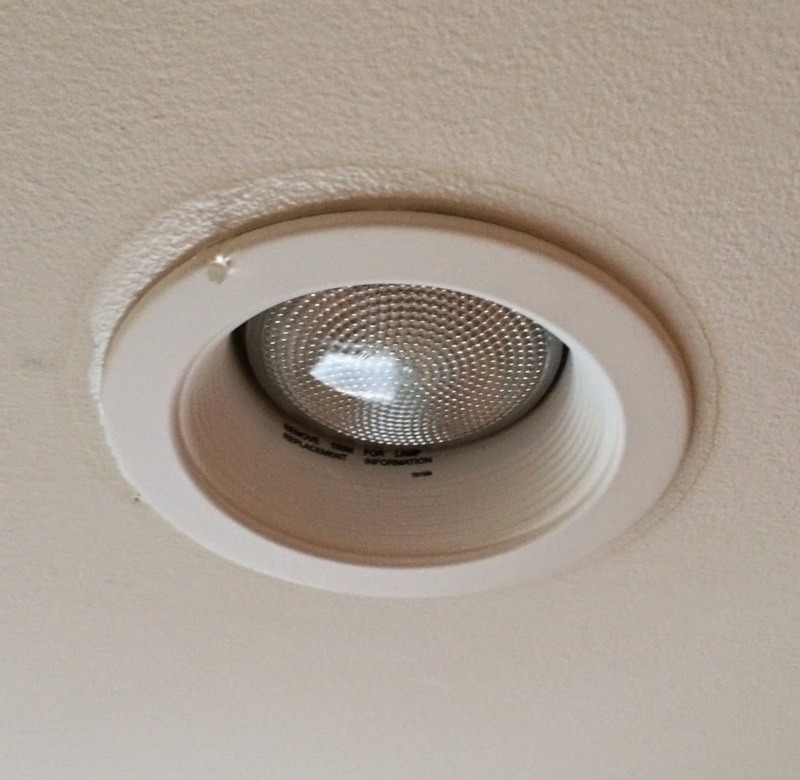 Then I looked up and realized there was a drip coming from the light fixture. NOT a good thing! The weird thing is, the bathroom isn't above the kitchen. So what was leaking? It's been really dry, we haven't had any rain. So I went exploring. Long story short, after crawling behind the knee wall the entire length of the house, I found a bigger puddle. And it ran along the heat pipe, behind the master bedroom wall. Thankfully my plumber is as crazy as I am and also works 7 days a week - and with the two of us going back and forth along the wall, we finally realized the source of the problem was in the wall next to the flue. The culprit? A finish nail that was used to nail the new baseboard to the wall. As we pulled the nail out, we heard the telltale 'whoosh' noise as air entered the pipe. And found a very rusty finish nail. But, you ask, didn't that get installed a couple of months ago? And hasn't that heat pipe been there for many years? Well, yes. But, we had an unusually cold night on Saturday and Dominic's theory is that caused the nail and pipe to contract, creating a pinhole leak. So, the good news? I discovered the problem very quickly, before it could do any major damage. We need to do a little touch up painting in the kitchen. 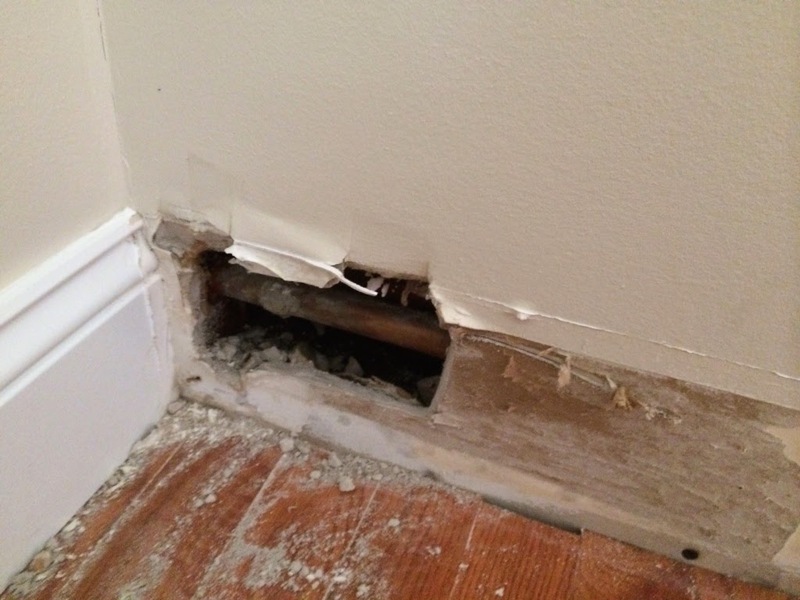 The pipe repair can be done behind the baseboard and once we get the baseboard back in place, we should be good as new. But what about resilience? Well in this business, anything can happen. And it frequently does, particularly when you think you've gotten everything finished. I could make a long list of the 'surprises' we've had, everything from things that accidentally got broken to weird things that you couldn't dream up. 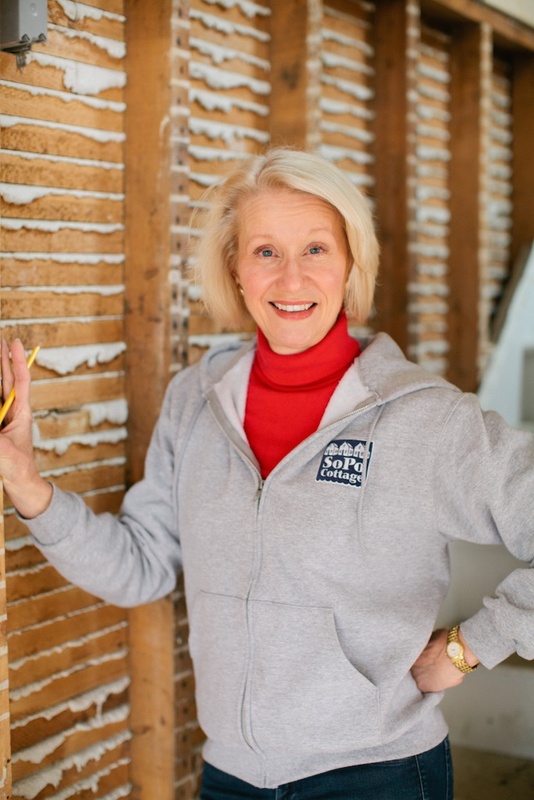 Because when you do a major renovation, you're touching lots of things and issues will crop up. But as long as you're resilient, you can keep moving forward and work through the problems! Yikes! Good catch. Water can be so destructive. Seems like everyone I know has a house flood (or almost flood) story. We once had a pipe break on the top floor of a Victorian home we had just finished renovating. Unfortunately, the leak occurred over a long holiday weekend when no one was home. We came home to falling plaster. Lucky you caught it when you did! Oh Maureen, that's terrible!!! Isn't it amazing how much damage water can do? Hopefully it wasn't too hard to repair your damage.